My name is Ivan and I don’t know if you will still remember me, I am the brother of Lafayette of Davao City, Philippines. I just want to share something which I hope you will find interesting. Manny Pacquiao is a professional boxer from the Philippines who is currently the most popular boxer in the world. Everytime he fights, there is practically almost zero crime rate in the Philippines. His statistics are 54 wins, 4 loses and 2 draws, 38 by knockouts and is the only eight-division world champion in the world. Everybody knows that Manny is very catholic. 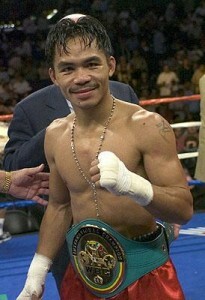 In all of his 60 fights, he always wore a rosary on his neck, prays in his ring corner when he gets up the ring, making the sign of the cross as most catholics do, kisses his rosary when it is removed from his neck before the start of the fight and makes the sign of the cross before the start of every round. He attends mass before a big fight and her mom always have a prayer group to pray for him during his fights back in his hometown in General Santos City, Philippines. STRIKE 1. The fight was December 8. Feast of the Immaculate Conception. Holy Day of obligation. Did not attend Holy Mass and receive Jesus in the Holy Eucharist. He ditches the catholic mass for a christian service. Its like ditching your brand new Mercedes Benz for a 20 year old Honda Civic. STRIKE 2. No more rosary in his neck, the rosary that he wore in all his 60 fights. STRIKE 3. No more sign of the cross before saying prayers. The outcome, he suffered the worst defeat of his career. 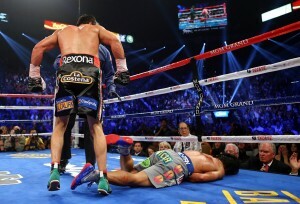 He was knocked out i think for the first time since his career started to go up. Sure he lost some fights but not knocked out with 1 second left in the 6th round. He was literally asleep for a few minutes. He fell face down in the canvass, right in front of a mormom, Mr. Mitt Romney. To Manny Pacquiao. You don’t need to change religion to show that you became a better person, a better catholic. You don’t need to change religion to start reading the bible or to start bible studies or preach the word of God. Come Home. Its never too late. Anyway Steve, thanks for allowing me to share. Just need to take this off my chest. God Bless and keep up the great work! I’m a big fan. very very true! ” you don’t need to change religion to show that you became a better person, a better catholic.” mama mary’s probably hurt right now. manny obviously didn’t know that the highest form of worship is the “MASS”. Manny, you are the idol of all heart of the world..I was very DISAPPOINTED knowing you change your faith..After all the graces that heaven has poured over you and your family, after all your prayers before and after your fight, the faith, the rosary you hang in your cross, kissed and cherish….. You turn yourself to them..Your reason is so shallow….WE ALL HAS THE CONTROL OVER OUR DECISION…TO BE STRONG OR WEAK WHEN TEMPTATION IS AROUND. So do not tell me that you found the truth in your new found religion. God gave us the freedom to choose between right and wrong…Jesus is the founder of Catholic church..It is never easy to follow God’s way…We all come to earth to learn. That is why we have bible to read or study and to search His words which is the truth…. I am trying to find on YouTube when Manny Pacquiao refused to wear the Rosary Beads anymore – I predicted that with this action he will lose the fight of Bradley and Marquez. I posted a comment on FaceBook about my prediction but I don’t think FB save all comments made from that year.